Hello! I'm really excited to show you today's post. I've been a fan of Alphonse Mucha's work for quite awhile, and I finally built up the courage to try and paint one of his pieces on my nails. His work is so breathtakingly beautiful, and the art nouveau style in general is stunning. I know these are different from anything I've ever done, but I love these so much, and I hope you do too. I really enjoyed working on these, and I'd love to do more like this in the future. The piece I chose to portray is 'The Seasons: Summer' from 1896. I love all of the different elements that could be translated onto the nail; from the hazy sky, to the exuberant poppies, to the coiling grapevine. The female figure was, as expected, the most difficult to paint. I started with basic shapes to get the proportions right, then added shading followed by highlights. 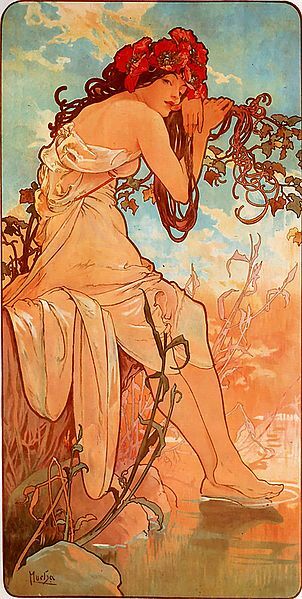 Luckily, Mucha uses distinct outlines, which helped define the figure. I'm not entirely happy with the facial expression, but I'm still pleased that I was able to give her any kind of face on such a small scale. I like how the scenery nails came out as well, especially the fading sky. I achieved the blending of colours with the same brush that I used for everything else. I just brushed nail polish on in layers, fading the colours into each other. Using minimal amounts of polish at a time worked best, and painting felt sort of like doing a dry brush technique. I used a whole slew of polishes for these, mostly from American Apparel: Summer Peach, Palm Springs, Port, Poppy, Downtown LA, California Trooper, American Denim, T-Shirt, Sunset Blvd, MacArthur Park, and Rose Bowl. I also used OPI You Don't Know Jacques and OPI San Tan-Tonio. If you're still reading this, thank you so much for sticking around! I really hope you like these, and enjoy the rest of your weekend! Jesus, Brittney! This is probably the most beautiful of your works! I absolutely love it! Alfons Mucha? I was sold already! But it's really a gorgeous recreation! Omg, this is amazing work. Beautiful!!! those are beautiful, you did an amazing job on these! bravo! Wow! You do some of the best freehand I've seen. Love the colours too. woooow, this is art! i love it! Incredible!! Absolutely gorgeous!! You've done a huge job!!!! this is truly a work of art! amazing! !